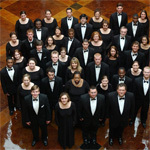 They are a choir of some 160-180 members with a wide age range including several students and have a reputation for giving concerts of the highest quality, presented with professional soloists and orchestra. In Michael Ashcroft, their Musical Director, they have a professional musician of the highest calibre. He is assisted very ably by Norman Harper, Assistant Musical Director, and Tim Sutton, rehearsal accompanist. They are very fortunate to enjoy the tremendous support of their President, Ian Partridge CBE, and also that of their regular audience members who travel to hear and see their performances.